The Automation Log actively records and stores a list of any manual or automated actions performed on your Contacts or Custom Objects. This feature comes in handy when you need to trace the path of your Contacts or a Custom Object through your automated builds for troubleshooting, or want to test any new builds you're likely to implement. The actions can be performed by Users, ONTRAPORT Smart Forms, Campaigns, API, Rules (advanced feature) and in-Sequence Rules (legacy feature). 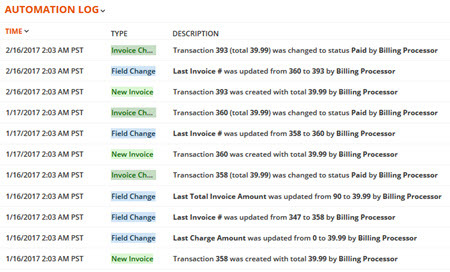 The Automation Log is located in the Contact Record or Custom Object Record on the History tab. Campaign - Distinguish when and how a Contact was added or removed from a Campaign and what or whom is responsible for the action. Tag Change - Discern when and how a Tag was added to or removed from a Contact and what or whom is responsible for the action. Sequence (Legacy Feature) - Discern when and how a Contact was added to or removed from a Sequence and what or whom is responsible for the action. The Automation Log records the date and time, the action type, and a description of the action. The Type column lists the type of action taken. Description includes the specific action, the source of the action and other identifying information such as a transaction ID. Date, by entering the date without the time stamp. Type by entering the type name such as Field Change . Field Name, such as "Card Expiration Date". Q. Can I export the Automation Log? A. No, the Automation Log cannot be exported. You can highlight the entries shown on screen, copy and then paste them into Excel. Q. We use a single log in for several Users; can we tell who is actually doing the action? A. The Automation Log records the User by looking at the log in information. That User will be listed as the one making the change. We recommend you use a different ONTRAPORT User for each person logging in. Q. I have a specific question about this process that is not covered in the article. Where can I get a quick answer? A. Check at the ONTRAPORT Q&A Forum. Or, during Support hours, chat our Support team for assistance (see the link in the help menu inside the app or initiate the chat at http://ontraport.com).